BOTANICAL INTERESTS MAKES SEED GARDENING EASY! Each Botanical Interests seed packet is rich with information on the outside and inside to guide you through each step of growing from seed to ensure your gardening success. When is the correct time to sow seed in my garden? A unique aspect of sowing seed the Botanical Interests way is using your average last frost date. You'll discover that sowing seed based on your average last frost date is best because it's based on your own garden's climate. This date is identified as the first day of the year when there is less than a 50% chance a frost will occur. If you don't already know your average last frost date, contact your local independent garden center or local county Cooperative Extension Service. There are also websites that provide maps and charts with frost dates specific to your state, city, or zip code. It's also helpful to know your average first frost date at the end of the season so you can determine the number of days in your growing season as well as plan your summer and fall sowings. Should I start my seeds indoors or outdoors? Nature sows directly outdoors. It's often the easiest for you, as well. Many times, plants sown directly outdoors are more vigorous and healthier than transplants. Large-seeded crops such as beans, corn, and squash germinate quickly when sown directly into the soil, often within a few days. Root crops such as carrots, beets, turnips, and radishes should always be sown where they are going to grow so their roots develop undisturbed. Some seed varieties can be started with success either indoors or in the garden. We help guide you with our recommendation on each packet. On the inside of every packet you will find the best growing conditions for the variety. We provide information about special care, organic gardening methods, and tips to improve your garden throughout the seasons. Also read our outdoor sowing guide to help determine when to sow which varieties: Outdoor Sowing Guide- Flowers, Ornamentals, Vegetables and Herbs. Your soil may be very different from soil that's in a neighboring yard. A soil test can help you determine what type of soil you have and provide suggestions for improving it. 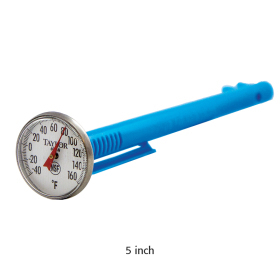 You will want to use a soil thermometer to determine the temperature of the soil before sowing, as optimal seed germination temperatures vary by variety. Contact your local university or Cooperative Extension Service. for information about soil testing, to see if your soil need improvement to grow healthy, productive plants. After sowing seed, soil should be kept moist, but not soggy, making sure the top layer of soil where the seed is growing stays moist. Dip a finger in the soil below the seed depth to check for moisture. Depending on your garden's climate, you may need to water more than once a day to keep the seed and soil moist. Too little moisture can prevent the seed from germinating, while too much water can contribute to seed rot. Sunlight is essential for plant growth. Most flowers and vegetables need "full sun", which means at least 6 hours of direct sun during the day. "Part shade" plants do best in 4 to 6 hours of unfiltered sun each day. A few types of plants will be happy in "shade", which is less than 4 hours of sun or day-long filtered sun. What types of plants should be started outdoors? Plants that don't transplant well (weakened by root disturbance). Plants that require very warm temperatures to sprout and get established. Vines (like morning glories or pole beans), bachelor buttons, sunflowers, carrots, beets, corn, cilantro and parsley. By following these guidelines and keeping a journal, all that's left to do is watch your seeds grow into beautiful, healthy plants!